ARCHN's chapter on Rand's morality thoroughly explores its various fallacies, especially Nyquist's thoughtfully argued sub-chapter on altruism. However, perhaps the most clearcut example of the highly unrealistic nature of her ethics occurs in her "The Ethics of Emergencies", in The Virtue Of Selfishness. "The Ethics of Emergencies" comes as standard with the usual Randian features, such the opening arguments from intimidation, wiggy, evidence-free psychological speculations, and the retro-fitting of standard terms, such as "sacrifice", with entirely opposite meanings to the usual ones (Rand often reminds me of something someone once said about Gertrude Stein: "she doesn't seem to know what words mean"). And as always, she maintains her habit of saying something on one page, and then taking it back on the next. But despite this typical thicket, we can eventually struggle through to find Rand stating an interesting and original ethical position, and stating it clearly. That's right. If you endanger your life to save a stranger, you are immoral. Not just immoral, but psychologically damaged, in that you lack self-esteem. Now, let’s try to imagine just such a situation, but in a world where almost everyone has adopted Rand’s moral code. A lone young girl is swept out to sea on a dangerous surf beach. The crowd stands by, doing nothing, as they have too much self-esteem to risk their own life for the young girl, who is after all a ‘random stranger.’ A man plunges in after her. Both nearly drown in the attempted rescue, but eventually after a great struggle he brings the both of them into shore alive. They both lie exhausted, gasping on the beach. Eventually he lifts his head only to be greeted by grim faces and contemptuous stares from the surrounding crowd. One woman eventually speaks, voice brimming with emotion: “That was the most immoral thing I’ve ever seen. You ought to be ashamed of yourself.” The crowd nod fiercely, and turn away in frank disgust. While this seems absurd, it is actually perfectly consistent with her general stance of the morality of only acting in your own self-interest. Clearly then, by Objectivist standards, people such as lifeguards, or firefighters, are not heroic as they are usually considered, but pursuing fundamentally immoral professions due to their "lack of self-esteem". But of course, while they repeat her rhetoric, Objectivists stop well short of actually living by it. Having just watched Oliver Stone's "World Trade Centre", where two trapped policemen are rescued by Marines (one a committed Christian) at considerable risk to their own lives, I wondered where the ARI's fierce condemnations of the "immorality" these and other voluntary actions on Sept 11 were. Because absurd as this seems, this is just what Rand is advocating. Those who wish to read Fred Seddon's reply to my response to his original review of my book are advised to locate a copy of the Fall 2007 edition of the Journal of Ayn Rand Studies and read it for themselves. I will not attempt to summarize it here. I merely wish to respond to one of Seddon's objections. As with his original review of my book, Seddon demonstrates a wanton blindness to the subtleties of my position vis-a-vis Rand and Objectivism. "[Nyquist] thinks Rand and the Objectivists limit logic to deductive logic," Seddon pontificates, "and the triumphantly claims that some modern sciences have proven that 'Most practical knowledge ... is based on generalizations drawn from experience,' that is, on induction." Seddon falls into just the sort of special pleading and word twisting that is more befitting an ambulance chasing lawyer than a philosopher. Instead of trying to understand my point, he only wishes to distort it for his own purposes, so he can evade facing up to the issues I raise. That is what he does with the phrase "generalizations drawn from experience," which he equates not merely with induction, but, by implication, with just the sort of induction advocated by Rand, Peikoff, and Kelley! Never mind that induction, except in a very loose sense of the word that surely would be opposed by Rand and Peikoff, has little to do with generalizations. Induction is a reasoning or inference from the particular to universal. The confusion arises because often the word general is used instead of universal, but it is a mistake to confound the terms general and generalization. The so-called problem of induction would not arise for a mere generalization, because no generalization can be refuted by a single observation. If I say that swans are generally white, that is very different from saying that all swans are white. The observation of a black or a purple swan won't refute the notion that swans are generally white, because generalizations are not universal. They allow for exceptions. But once you grant exceptions, you're no longer in the realm of inductive "logic." Can anyone imagine, for example, Rand or Peikoff advocating the view the laws of nature are only "generally" true, that, in other words, there exist exceptions to them? And so Seddon is merely conflating the term generalization with the term universal and thus basing his whole argument on an ambiguity of language. Yet this is not the least of it. If Seddon had been attentive to the full context of the passage quoted, particularly what had been written earlier about unconscious knowledge, he should have understood that little if any reasoning takes place when people form the generalizations that make up what I called practical knowledge; that such generalizations are often made intuitively, without conscious direction, from the innermost reaches of the mind's unconscious database. This, in and of itself, makes the whole issue of induction irrelevant. Rand's reason, even when applied to the homely generalizations of everyday life, could be as inductivist as Seddon or anyone else pleases; that still would not allow Rand's empirically unsubstantiated claim that "Reason is man's only means of grasping reality and of acquiring knowledge" to pass muster. If people can gain knowledge intuitively, without direct conscious thinking at all, then the Randian view that only "reason" leads to knowledge becomes unacceptable. In the greater scheme of things, these technical arguments about the role of reason and "induction" in the Randian epistemology are of little relevance and are only brought up by Seddon to throw sand in our eyes. The real point at issue, which I have raised again and again and which Seddon sedulously evades, is the issue of evidence. Rand made any number of statements about matters of fact concerning human nature, human cognition, and social interaction. Many of these statements are highly controversial, such as man is a being of self-made soul or man's emotional and cognitive mechanisms are blank at birth. Yet Rand provided no evidence for these controversial statements of fact. None whatever! And neither does Seddon. There may be a very good reason for this. Perhaps the lack of evidence stems from the fact that these assertions are not true! JARS: "Rand and Empirical Responsibility"
The following is my response to Fred Seddon's review of my book Ayn Rand Contra Human Nature. The point of this response was not merely to reply to Seddon's criticisms, but, just as critically, to restate my argument against Rand, which is become even stronger because of new evidence gathered by the sciences of human nature. 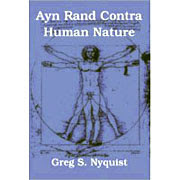 This essay originally appeared in Fall 2006 edition of The Journal of Ayn Rand Studies, Vol. 8, No. 1, pp. 111-119. Please refer to the JARS issue for a full bibliography. novels of Flaubert and Tolstoy, will in some degree be diminished. idiosyncrasy, something that can be brushed aside as inconsequential. about determining whether Rand’s vision of man accords with reality. in power are foolish enough to implement them. that’s precisely where many philosophers, including Rand, fall short. Seddon have then seen fit to accuse me of being a rationalist? whether they are true or at least plausible. But Rand gives us nothing. Not even the tiniest shred or sliver of evidence. use logic is invalid or cognitively dubious. that stands witness against Rand’s theories? empirically untenable,” they insist (1999, 439). consciously deliberated reason even has a chance to occur. threatens her over-romanticized conception of man. of judging themselves objectively. Worse, they don’t even realize this. 263–66)—then making a virtue of pride may not be such a great idea. human nature somehow renders pride unattainable for most people. image of . . . the rational being he is born able to create” (1961, 160). violate their freedom of choice (169). were unrealizable, and could be dismissed on those grounds alone. prejudices from contaminating our scientific work. may, for all I know, deserve very high marks. are some advantages as well that must be weighed in the balance. suddenly Objectivism is transformed into a kind of Sorelian myth. JARS: "A Beauty Contest for Dichotomies: Browne's Terminological Revolutions"
Roderick T. Long, responding to Gregory Browne's article "The 'Grotesque' Dichotomies Still Unbeautified," contributes a rather technical article that will strike some readers as pedantic and other as niggling. In any case, despite the subtle clarity of much of Long's analysis, to my mind he altogether misses what should be the main point of the whole exercise. At stake in any debate over the analytic-synthetic dichotomy (and that's what the debate really is all about) is the question of what is the best way to determine matters of fact: deductions from first principles (i.e., from "axioms" and the like); or experimental reasonings based on scientifically controlled observations and criticisms from qualified experts (i.e., the scientific method). I contend that the scientific method is far and away the best method of determining matters of fact, and that, when stripped of all the pedantic excesses that Kant placed around it, this is what the analytic-synthetic is striving to assert. And so any attack on this dichotomy, particularly one that goes all the way down to its core truth about the cognitive superiority of "empirical science," is motivated by a desire to give speculative philosophy the same cognitive standing as scientifically tested knowledge and common sense knowledge derived from observation and experience. The Objectivist attack against the analytic-synthetic dichotomy is simply a roundabout way of rationalizing Rand's deplorable empirical irresponsibility. Rand wanted to believe in a theory of human nature that fails to accord with the facts. Since she could not defend her theory on the basis evidence, she chose instead to defend it with the appearance of logic. The argument for the Objectivist version of free will is essentially an argument for Rand's theory of human nature. Bear in mind: she provided no other argument for her view of man--none whatsoever! Her argument is presented as if it were a kind of logical validation on par with empirical evidence. But since this sort of procedure for determining matters of fact is challenged by the analytic-synthetic dichotomy, Rand had Peikoff write his notorious article against it. Curiously, Browne himself, as noted by Long, complained that Rand and Peikoff have an "excessive aversion" to more geometrico reasoning (i.e., to determining matters of fact through logical or pseudo-logical constructions, rather than through observations, research, and the scientific method). I don't know where he finds this "excessive aversion." If we judge Peikoff and Rand, not merely on what they say, but how they go about their business, it becomes clear that more geometrico reasoning is one of their favorite methods of defending Objectivist dogma.